If you are like me and didn’t venture yesterday, there are still deals to be had. 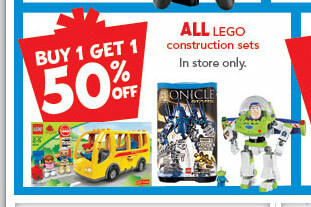 Toys R Us is running a Buy One, Get One 50% off sale on ALL LEGO sets, which is an incredibly good deal. It’s good because it should cover Harry Potter, the new Pharaoh, the new Atlantis, and some of the other new sets, as well as older sets. I don’t think it covers any of the games. If you’re looking to do some holiday shopping, and have a Toys R Us nearby, it’s worth it. Note: The Toys R Us sale is only for today, Saturday, November 27, 2010. Slave 1 can actually be found at a lot of places (Target) for $10 off which brings it down to around $69.99. I mention Target because I’ve seen it there a few times at that price over the past few months.